Group theatre options and discounts for a cultural weekend in Chicago. Plan a culture-filled group visit at Chicago's top theaters with these ideas and tips. Chicago boasts more than 200 theaters, with an unprecedented 5 Tony Award-winning regional theatre companies. The local award-winning theater scene showcases everything from Broadway world premieres to edgy original productions year-round. Treat your culture-hungry group to some of the city&apos;s renowned stages and jaw-dropping talent with this sample itinerary. Start your morning at Wildberry Pancakes and Café and see why their flapjacks have been voted best in Chicago. 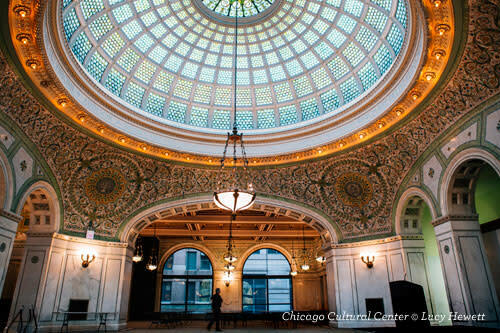 Next, head to the Chicago Cultural Center (above), where free music, dance, cinema and art exhibits, and the world&apos;s largest Tiffany stained glass dome sets the tone for a spirited day. Call ahead to arrange a free 45-minute group tour. For lunch, let them follow their cravings at Foodlife, an urban dining venue with 14 distinctive kitchens serving from-scratch BBQ to sushi. Vouchers are available for groups. Catch a matinee at the legendary Steppenwolf Theatre Company (above), founded in the mid-70s by actors-in-arms Jeff Perry, Terry Kinney and Gary Sinise. Group tickets can be purchased for any performance throughout the season. For more information, contact groups@steppenwolf.org. Another option: See a thought-provoking play at Lookingglass Theatre Company in the historic Water Works building. Groups of up to 200 are welcome and student tours and group discounts are available. 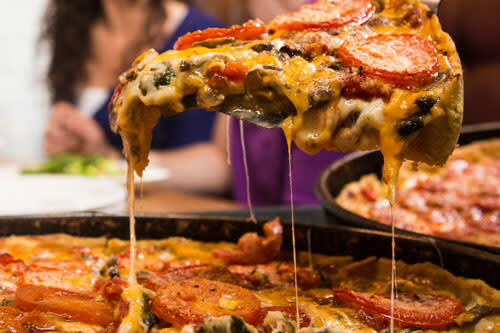 For dinner, go classic Chicago with deep-dish pizza from Gino&apos;s East, Giordano&apos;s or Lou Malnati&apos;s Pizzeria (below). Ask about private dining spaces and party packages for groups. Dazzle groups with a hit Broadway musical through Broadway In Chicago at multiple venues downtown, such as Cadillac Palace Theatre, the James M. Nederlander Theatre and The PrivateBank Theatre. Turn in at the art-centric Hotel Palomar Chicago, where the surrounding River North neighborhood&apos;s art galleries and nightlife beckon if guests have the itch for a nightcap. Spend the morning exploring Chicago&apos;s lakefront playground. More than 50 acres await at Navy Pier, including a revamped communal dining experience (point groups towards rustic fruit tarts and fantastic coffee at Goddess and The Baker) and the beloved Chicago Shakespeare Theater (below). Inquire about the theater&apos;s free Audience Enrichment programs and performances on tap for the year-long Shakespeare 400 event. Discounted tickets are available for groups of 10 or larger. Head to the Loop for a casual lunch of hand-carved sandwiches and daily Chicago specials from the Berghoff Café. 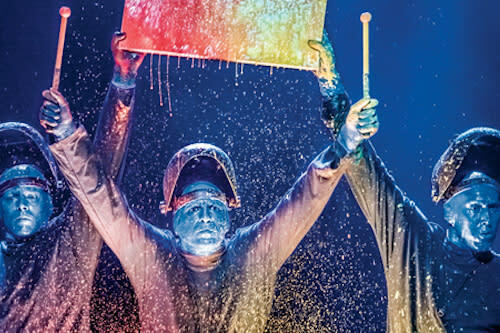 Book a matinee with the Blue Man Group (below) at the Briar Street Theatre. Schedule a special pre-performance group Q&A session with a Blue Man and then settle in for a thrilling stage-stomping afternoon show. Group discounts for 10 or more are available. Catch your breath over appetizers and drinks at the popular Tavern at the Park or treat yourselves to a leisurely steak dinner at Millennium Park&apos;s Park Grill Chicago before diving back in with a moving music and dance ensemble at the Harris Theater (below). For budget-hunters, this annual two-week celebration of Chicago&apos;s world-class theater is the perfect way to catch a show without spending a fortune. Each February during Chicago Theatre Week, visitors and locals can choose from more than 100 productions, with tickets specially priced at $15 and $30 (or less). Free and discounted concerts, cultural exhibitions, theater productions, city tours and other activities the second Friday of every month. Learn more. 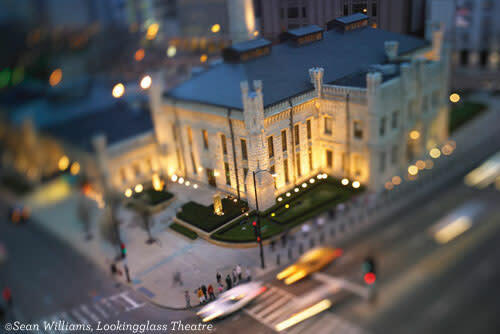 Tip: Check the League of Chicago Theatres&apos; ChicagoPlays.com to view shows for over 200 theaters all in one calendar. See More for Less: Before you pay full-price for your theater event, be sure to check Hot Tix, which has last-minute discounted tickets for every night of the week.